Substitute for Indefinite Values At times calculations result in indefinite values (for example, when a division by zero is encountered) or are indefinite by definition (for example, masked pixels). In this cases ImageLab replaces the value by the substitute for indefinite values. This substitute is by default -1 and can be set by the user to any value between -10100 and 10100. Max. Dynamic Range of Peak Ratios This setting limits the dynamic range of peak ratios of spectral descriptors. The peak ratio typically becomes high if the denominator of the ratio is approaching zero. Max. No. of PCA Eigenvalues in Protocol The speed of generating the report on PCA details is rather time consuming for large data matrices. In order to avoid long waiting times the user may set a threshold above which the protocol is not generated at all. Max. No. of PCA Scores in Protocol The speed of generating the report on PCA details is rather time consuming for large data matrices. In order to avoid long waiting times the user may restrict the number of scores to be listed in the protocol. Sampling Limit - 3D Surface Plots If the number of pixels is too large to display a 3D surface plot, the image data is automatically resampled. The threshold where resampling occurs can be set between 2000 and 50000 pixels. We recommend to use 10000 pixels which provides a good compromise between screen resolution, speed of processing and amount of smoothing. Sampling Limit - Color Scales The color scales of various plots are calibrated to the percentiles specified by the parameter Color Scale Range on the tab "Images/Colors". The calculation of percentiles can be time-consuming for large datasets. In order to avoid unnecessarily high computation times you can restrict the calculation of the percentiles to a random sample whose size is determined by this parameter. Hint: the lower the samling limit the faster is the calculation but the more the estimation of the percentiles will vary. A good compromise is about 50000 samples. Sampling Limit - Masked Pixels If the number of masked pixels is too large to display them in the mask editor with acceptable speed the displayed marks can be resampled automatically. The threshold above which resampling occurs can be set between 10000 and 5000000 pixels. We recommend to use 200000 pixels or higher values. 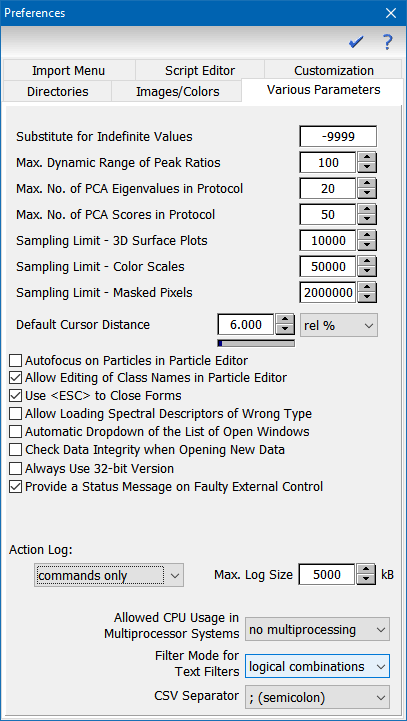 Default Cursor Distance When editing or creating spectral descriptors it is sometimes useful to bring the parameters of a spectral descriptor to the center of the currently visible spectral region. The default cursor distance defines the distances of the cursor lines (specified either in percent of the length of the visible spectrum, or in absolute values, depending on the selection box at the right of the distance value). Use <ESC> to Close Forms If this option is ticked off you can close the form which has the focus by pressing the <ESC> key. Allow to Load Spectral Descriptors of Wrong Type This option is for debug purposes only and should be turned off. If the option is activated the user may load invalid sets of spectral descriptors after confirming a warning message. Automatic Dropdown of the List of Open Windows If this option is turned on, the Open Windows Selector is opened when you move the mouse over the control (otherwise you have to click the control in order to open it). Check Data Integrity when Opening New Data Although checking the data integrity is good idea in order to protect against manipulated data, it is sometimes counterproductive because the integrity check takes considerable time (especially for large images). This option allows to switch on/off this check of the data. Automatic Reload of the Data used at last If this option is set ImageLab automatically reloads the dataset used at last (which may take considerable time if you load big datasets). So for large datasets you could consider to switch off this option. Always Use 32-bit Version This option allows you to start ImageLab in 32-bit mode regardless of the actual capabilities of ImageLab. Permanently activating the 32-bit mode on 64-bit operating systems is not recommended unless you have a specific requirement for using the 32-bit mode. Provide a Status Message on Faulty External Control This option controls whether a status message is displayed in the case an external program tries to control ImageLab by a faulty control script. Tick it in order to receive feedback in the case of problems. This option should be routinely activated during the development of control scripts. Action Log If this option is selected the actions of the user are recorded in an action log. We recommend to keep this option turned on at level 1 ("commands only"). The action log is stored on the local disk and will help us to support you in the case of an unexpected behavior of ImageLab. In the case of a support case we will ask you to send us the action log file. The maximum size of the log file can be set by the control right to the checkbox. Attention: setting the action log to level 2 ("log everything") will record all kinds of low level actions and will slow down ImageLab. Do not use it unless you are asked by a service technician. no multiprocessing All tasks are running at the speed of a single CPU core (which is commonly the "normal" speed for most applications). 2 cores The speed of certain time-consuming tasks is increased by a factor of 2.
all but one core This option provides almost maximum performance while leaving enough power for non-ImageLab related tasks. For example, a 4-core hyper-threading processor will assign approx. 88% of the full processing power to ImageLab. all cores All available CPU cores are assigned to ImageLab. This ensures maximum speed, but may cause intermittent short pauses in other programs. Filter Mode for Text Filters The filters used in the spectral collection and in the bookmark dialogs to narrow down the displayed list can be applied in two modes: either a simple substring search or a logical combination of several substring searches. simple search The search is a simple substring search. Lines of the list which partially match the filter string are enabled, all other lines are grayed out. For the simple search all available characters can be used. logical combinations The search consists of several substring searches which are combined by a logical expression. Lines which evaluate to TRUE are enabled, all other lines are grayed out. Please keep in mind that the allowed characters for logical combination searches are restricted. For further details see the section Logical Combinations in Filter Expressions. CSV Separator The CSV Separator specifies the separating character used for CSV (comma-separated values) files. Comma, semicolon, colon and tabulator are supported.